The World Bank approved in 2014 a plan to study the Ayeyarwady river, the main river in Myanmar, in order to develop the area. Local communities fear that the plan will bring new development projects that will affect their livelihoods. The Irrawaddy river, locally known in Myanmar as the Ayeyarwady, is often described as Myanmar's backbone. It originates in the northern region of Kachin and flows through the central area splitting the country into two parts, until it empties through the Irrawaddy Delta into the Indian Ocean. It is the country's largest river and the most important commercial waterway. Traditionally, the Irrawaddy river has been central to Myanmar's economy. After the political and economic opening of the country started in 2011, the Irrawaddy has gained new investment interest. Nevertheless, the management of the river is still far from being systematized and comprehensive. In December 2014, the World Bank approved a USD100 million loan to implement a research and development program for the Irrawaddy basin under the name of Ayeyawaddy Integrated River Basin Management (AIRBM) . The program aims at collecting information about the Irrawaddy for future development. Thus, according to the Myanmar Times, the government has pledged that “natural resource conservation together with development, priority areas for investment, environmental impact assessment, social impact assessment and opinions of the residents will be taken into account ”. 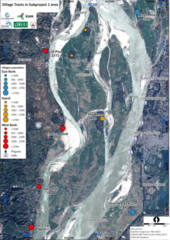 While NGOs recognize the importance of having enough data for a better management of the river , environmental groups have raised concerns about the use that will be given to the data collected and the impacts of the new activities on the river . The government has already started implementing a 'Navigation Enhancement Plan' from Mandalay to Nyaung-U  that will feature navigation enhancements and that will include the construction of retaining walls and concrete barriers for the riverbed and digging sandbanks, among others. The data might also be used for the development of hydropower projects, mainly in the upper part of the river, and for the development of other controversial projects, such as the Amarapura Urban Development Project. Environmentalists have also rejected the designation of the Irrawaddy River as an “international river,”, included in the project, saying the trans-border status could invite undue influence on the river by neighboring countries . The project is expected to end in September 2020 . The International Centre for Environmental Management (Australia) has been appointed as consultant for the project. Why? Explain briefly. The project is still at an early stage and local NGOs are just starting mobilizing. ICEM. 2017. Environmental and Social Impact Assessment (ESIA) and Environmental and Social Management Plan (ESMP) for Subproject 1, Draft Scoping Report for ESIA/ESMP. Prepared for DWIR and the WB. Hanoi.